I've raved about the Fage before, how good it is with an apple. At only 2 Points and 13 grams of protein the yogurt is really good bang for your calorie buck. 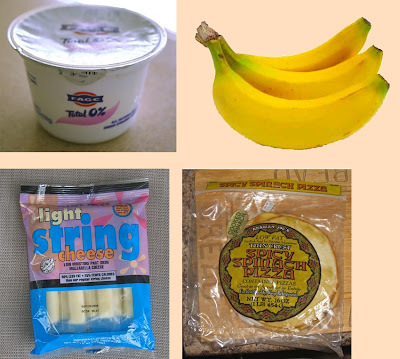 The Trader Joe's Light String Cheese is great because it's only 1 Point, most are 2 Points, even other light versions. Bananas are, well, bananas. And the Spicy Spinach Pizzas weigh in at 3 Points but they are super tasty. I pop them in the toaster oven and four minutes later...yummmy. So those are some quick and easy snacks but I have a couple cracker snacks I also want to share. 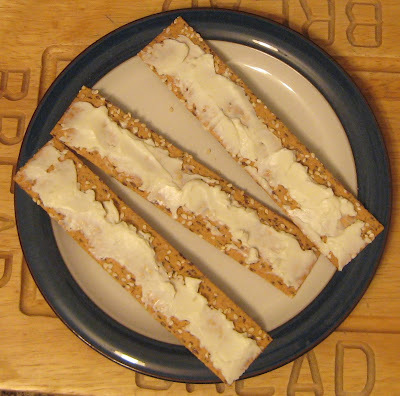 First is the Flax & Honey Flatbread crackers with The Laughing Cow Light Original Swiss spreadable cheese wedge. Together with a piece of fruit and a big glass of water and you've got a pretty hearty snack. But Kristy told me about a snack she's been eating lately, hummus mixed with cottage cheese, so I tried out a version of it with crackers. I took 1/4 cup of the hummus at 1 Point blended with 1/4 cup of the cottage cheese at 1.5 Points (I did Lowfat instead of Fat Free because of the nursing, when I'm no longer breastfeeding I'll go back to FF) spread on a serving of the crackers at 2 Points for a very hearty, tasty 4.5 Point snack. Maybe post-nursing I'll cut the serving in half. What else do I snack on? I like cottage cheese and a can of mixed fruit or peaches in lite syrup (I buy this box at Costco and always have them on hand). With FF cottage cheese it's a nice 2 Point snack. Notice a trend in my snacking? Protein. Protein is the secret to fulfilling snacks. Without it, I'm hungry again 10 minutes later. Of course fruits and veggies make great snacks too so I'm always stocked up on 1 Point apples and various other favorites. How do I know the apples are 1 Point? Because they all are. In my book, all apples (and all oranges) are 1 Point, no matter the size. I did not get fat eating apples and oranges. On a slightly sad note I'm a little bit under the weather. I wonder if I pushed my body a bit too much? I feel good but the virus makes me think maybe I wasn't as strong as I was feeling. No, I don't have the swine flu, but a little bug that's keeping me from working out. So far I've tracked this week, even the THREE (!!!) Weight Watchers' ice cream bars I ate yesterday. Hopefully I can keep the eating in check (that is, not go over my allotted points) since working out isn't an option right now. That is a great idea (about the hummus). I love hummus, but I can eat that entire little container from TJs in one sitting, so I generally stay away. I'd never thought of mixing it with cottage cheese! Genius! Oh my gosh I wish I had your discipline. I probably haven't eaten a fruit or vegetable in a week! I'm horrible. Keep up the healthy eating! Yummmm this post is making me hungry! Love the snack ideas. Those pizza things look great...wonder if we have them around here somewhere. And thanks to your inspiration I've started tracking my points too. Not prefect but oh so much better then I've been. Thanks much! I love reading about what you are eating. It really motivates me and gives me great healthy options I would not have thought of- love the cottage cheese and hummus idea- you rock- thanks so much! Yay Michelle! What great snacks! Glad you liked the cottage cheese/hummus dip. I took it to a barbeque last night and it was a hit there too. Hope you feel better soon. And you better not give the little man that bug! I will try and find those crackers at TJ's this week. I love the snack ideas. I love TJ's sun dried tomato hummus. I will have to try that with the cottage cheese. Who would have thunk it? These are all great snack suggestions. I love those flax crackers, but never thought of putting that hummus-cottage cheese spread on them. Great idea! Super yummy snacks! I love hummus and will have to try that mix. Hey, I left you something on my blog for you! Hi Michelle! I had to come back to this post and thank you for snack inspiration! I get in a bad rut about snacks (now when they are so necessary for that afternoon pregnancy fatigue!) and your idea of flatbread + laughing cow + apple really caught me. I've been having the healthiest snacks thanks to you! It is perfect. I am so bad at getting fruit into my diet so this was a much-needed piece of inspiration. Happy belated mother's day to you and your beautiful family! i seriously could not live without trader joes! they are the only ones in my area that carry my favorite flaver of the fage yogurt. honey!